Of all the bookshops serving the Jewish population of the East End, by the nineteen-sixties only a handful remained. Of those, two in particular were remarkable to me – Cailingold in Old Montague St and Shapiro, Vallentine in Wentworth St.
‘M. L. Cailingold’ was owned by Moshe Leib Cailingold who came from a bookselling family in Warsaw and died in 1967. He arrived in England in 1920 to establish a branch of the family business and opened a tiny shop in Old Montague St, but what few people knew was that opposite the shop he had a narrow, ramshackle, five-storey warehouse which housed his stock. Moshe dealt in rare and scholarly books, maintaining an office at 37 Museum St, where he kept his most valuable items and from where he functioned, too, as Hebraica and Judaica adviser to the British Museum. As he got older, Moshe could no longer negotiate the stairs up to the upper floors of his East End warehouse and the stock lay undisturbed for years. At the age of twenty-two, Moshe’s daughter, Esther, had gone to Jerusalem to teach English at the Evelina de Rothschild School, headed for years by the legendary Miss Annie Landau, the aunt of Oliver Sacks. Esther was killed fighting in defence of the Old City of Jerusalem during the 1948 Israeli War of Independence and Moshe’s other daughter, Miriam (‘Mimi’) married the distinguished Israeli diplomat and civil servant Yehudah Avner who at one time was Israeli ambassador to London. Moshe Leib Cailingold passed away in August 1967 and, soon after, Asher and a cousin arranged a sale. It was an international event. Before the building was open to the public, it was open for collectors and dealers who flew in from Israel, America and Europe. At the time, I was a young, impecunious university student, just beginning a lifetime’s collecting obsession with Judaica and I knew that by the time the building opened to the public, the best books would be gone – not that I imagined that I would be able to afford any of the rarities, but I wanted the experience of seeing them! So I made my way to the East End and offered to work at the sale, carrying books in return for access to the warehouse. Asher Cailingold agreed and I enjoyed a magical couple of days roaming the warehouse in Old Montague St. I was assigned to individual buyers as they went through the stock and they gave me piles of books to carry down to the bookseller’s son to assess and price. On the ground floor of the warehouse was a lean-to outhouse which no-one had paid any attention to until the last day of the private sale, when a well-known collector from Manchester asked if anyone knew what was inside it. The contents were a mystery and I was dispatched to find a crowbar to prise open the padlocked door. When we opened the lean-to, it was stacked with books. The collector from Manchester reached inside and snatched one book at random. He opened it, turned to Asher and said, “I’ll buy the whole contents.” The book he held in his hand was a rare antiquarian Hebrew tome printed in Venice and it turned out that the outhouse contained the stock from Moshe’s father’s bookshop in Warsaw, untouched for decades. Although, I could afford to buy only a few ephemeral pamphlets and books, it was a great experience for me. Osborn St was home to another well-known bookseller and general Judaica store, R. Golub, and across from there was Wentworth St containing the small shopfront of ‘Shapiro, Vallentine’. Shapiro, Vallentine was a publisher and bookseller with roots that went back into the nineteenth century. Originally owned by the Nirenstein family, in 1940 their daughter, Miriam, married a young Russian émigré, Chimen Abramsky, and he took over the store. Chimen, who passed away in 2010 at the age of ninety-three, was an astonishing, if diminutive, personality. He was the son of Rabbi Yechezel Abramsky (1866-1976), one of the great Talmudical scholars and Jewish legal authorities of the twentieth century, and in the thirties the rabbi of the great ‘Machzike Hadass’ (“Upholders of the Faith”) synagogue on the corner of Brick Lane and Fournier St – which, famously, had been built as a Huguenot Chapel, became a synagogue and is now a mosque. 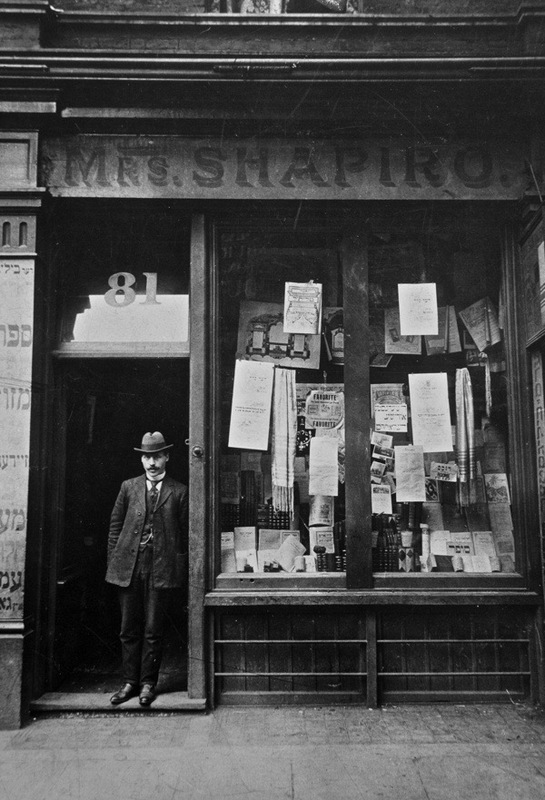 Shapiro, Vallentine was a trove of scholarly, academic and rare Judaica and rare, left-wing and radical literature and ephemera. Chimen knew his subject and served for years as Sotheby’s consultant and expert on Judaica and Hebraica, and later as adviser to Jack Lunzer who created the Valmadonna Trust collection. Eventually, Chimen closed the shop in the late sixties when he was appointed to the faculty of University College, London, later becoming Professor of Jewish Studies. As a leading theoretician of the London Left, an expert on Marx and Marxism, and on Jewish history, Chimen had a brilliant, polymathic mind, and an encyclopedic knowledge of books, printing, and manuscripts. He and his wife Miriam had two children – Jack, a mathematician and their daughter, the distinguished cultural figure, Dame Jenny Abramsky, formerly of the BBC. Wonderful story to read. Thank you for imparting your East End knowledge and social commentary. A beautiful and touching story. Thank you. Very, very interesting. Thank you for sharing this well-written and heartfelt piece. Those store owners/scholars come alive from the page. Interesting post, rich in history and information. Thank you for these lovely, rich verbal portraits. They remind me why, as a Christian growing up in the 1950s in a predominently Jewish neighbourhood, we WASP kids were often so envious of the Jewish kids. Our lives seemed so small and anemic in comparison to their lives, which were so often populated by brilliant, extraordinary personalities. Wonderfully evocative, and a reminder of the rich history of Jewish booksellers, publishers and printers in the East End. A history bound up with working-class immigrants and with the Yiddish language. Long before Ceilingold and Abramsky there was the radical publisher Barnet Ruderman, a pioneer of the Jewish labour movement in the 1890s, and a bookseller in Hanbury Street, Spitalfields. Ruderman’s big break was as the London agent for Avner Tanenboym, whose bestselling Yiddish potboiler ‘Secrets of the Russian Imperial Court’ would have been wildly popular in Whitechapel. Mazin’s, ‘Hebrew bookseller and drapery dealer’ in Whitechapel Road was another well-known East End landmark for decades. As was Weinberg the printer/publisher in Brick Lane. Active in the Jewish workers’ party, the Bund, in his native Poland, Weinberg published a Yiddish weekly called the Family Friend in the 1920s, featuring a popular column called ‘Der Vaytshepeler Filosof’ (the Whitechapel Philosopher). Moyshe or Morris Zusman was another immigrant bookseller/printer/publisher/bookbinder who opened his shop at 90, New Road in 1907. Yiddish translations of Oscar Wilde were among his early imprints. He was also the local Yiddish theatre impresario, booking acts from Poland, the US and beyond. And then there was Israel Naroditsky, a yeshiva-trained radical, and another scholar/publisher in the mould of Ceilingold and Abramsky. Naroditsky ran a print shop on Mile End Road and published hundreds of books from the 1890s until the 1940s. His three sons, Carmel, Bar-Kochba and Zerubavel, carried on the business, promising their father that they would continue to subsidise the printing of local poet Shtensl’s monthly Yiddish literary pamphlet ‘Loshn un lebn’ (Language and Life). There were dozens of others, just as interesting. Chimen Abramsky had known many of these pioneers and had even acquired their stock in some cases. 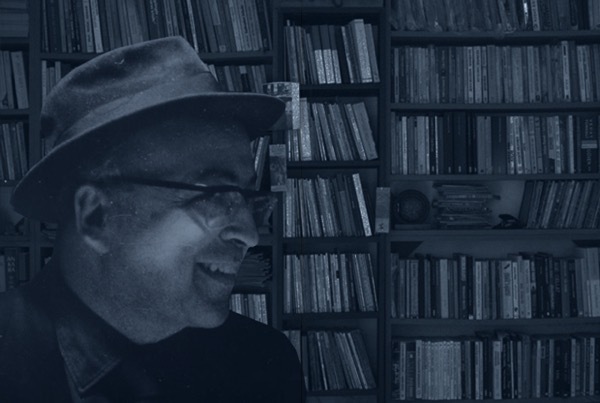 He talked about books as if they were old friends; he would pull one off the shelf, then proceed to tell you about its previous owners, where and when they had first met, and what was special about it. He was the last link with a century of Jewish immigrant bookselling and publishing in Whitechapel. Beautiful. You honour these people by your memories. How their lives shine like a beacon in this tawdry world. As a young boy and great nephew of Moshe Calingold, my father and I had the honor and experience of a lifetime to help Asher clean up and sort the books before the sale. I have many times told my family the story of the lean-to as I was upstairs in the Old Montague St. sorting books and we all rushed to see the amazing collection which had accumulated dust for many years. This has just been forwarded to me by my nephew, Danny Avner (Haffner). My wife Edna, nee Lunzer, was my entry to her cousin Jack’s amazing collection: the Valmadonna Trust. The contrast with my late father’s stock was breathtaking. Instead of the dust-covered, pre- Shoah treasure trove of judaica/Hebraica, Jack Lunzer’s collection was pristine, with his most valuable items kept in vaults and sometimes even in his bedroom. As we say in Israel, Kol HaKavod to you, Paul for your thorough research and your great presentation. WOW, what an amazing recollection of the info, and so much more . I am one of the grandchildren of Reuven , Moshe’s brother, Zeilingold ( the original last name from Poland, that was misspelled in England to Cailingold). we all knew about the book publishing in Poland, not in England and also knew about Esther and have the copy of the book about her.